The replacement of the Centre Street Bridge over the Third River required a temporary and permanent support of excavation design to allow for the installation of the new bridge foundation. Lahita Engineering was tasked with the design of a steel sheeting wall and tie back support of excavation. The shallow bedrock elevation required the design and installation of toe pins at the bottom edge of the sheeting wall in order to resist soil and surcharge pressures. Greenwich Country Day School’s original school building required temporary shoring during its expansion/construction project. A large portion of its foundation wall required removal while the remaining upper floors were supported on temporary steel posts and beams. Lahita Engineering designed the temporary shoring and provided construction support services during installation. 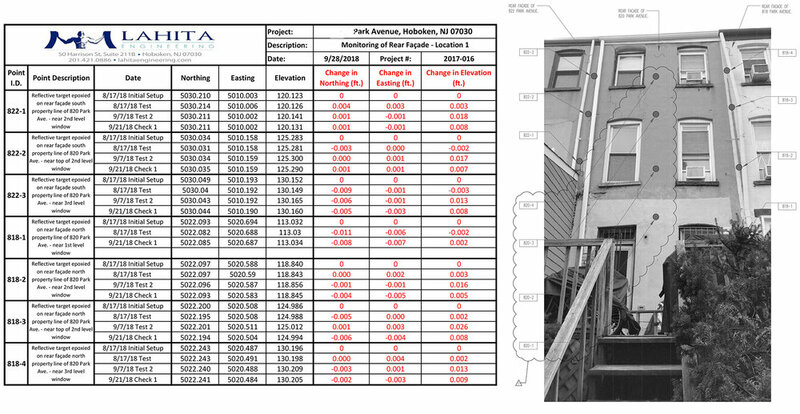 This project required construction monitoring of the rear masonry façade wall during construction. A baseline survey was taken (using a total station) of targets placed on the wall before any work was implemented. Weekly surveys were completed to ensure that the masonry wall was not moving. This project required design of helical piles for the contractor to satisfy contract drawing requirements. Pile type, size, helices, grout column diameter, spacing, required torque and depth were specified, along with all other required information. This project required design of micro-piles for the contractor to satisfy contract drawing requirements. Casing size, free and bond lengths, grout column diameter, spacing, and depth were specified, along with all other required information.